Once a hub for the eclectic artist community based in the Fremont neighborhood of Seattle, Fremont Foundry now functions as a versatile event space and wedding venue. They were in search of an updated website in order to better reflect the unconventional and unique space offered. I lead a small team through the redesign process while working closely with the Fremont Foundry event manager. Fremont Foundry was outfitted only with an outdated website, and a logomark. Our only guideline was not to change the logomark. Before beginning the redesign process, it was important to refine and establish brand principles to guide our process. Working closely with the event manager, we created a set of Brand Traits inspired by the space itself: Bold, Beautiful, Unconventional, Modern, and Industrial. Fremont Foundry already had an abundance of beautiful, high-quality photographs, which inspired our color palette. The Brand Traits guided our design decisions throughout the redesign process. We chose bold colors, typefaces with a modern and high-end appearance, and contrasted collages of images with generous negative space and airy font treatments to achieve the final outcome. Fremont Foundry's old website focused heavily on the floor plans of their rental spaces and their partners, didn't feature images of the space or events, and used outdated parallax scrolling and a single-page site. We had evidence from users that they wanted to see images of the space, and weren't as concerned about the floor plans. Adhering to the brand guidelines we established, we created a bold and modern responsive site that focused heavily on the beautiful images of the interior of the building, and that demonstrated the wide variety of events that Fremont Foundry hosts. 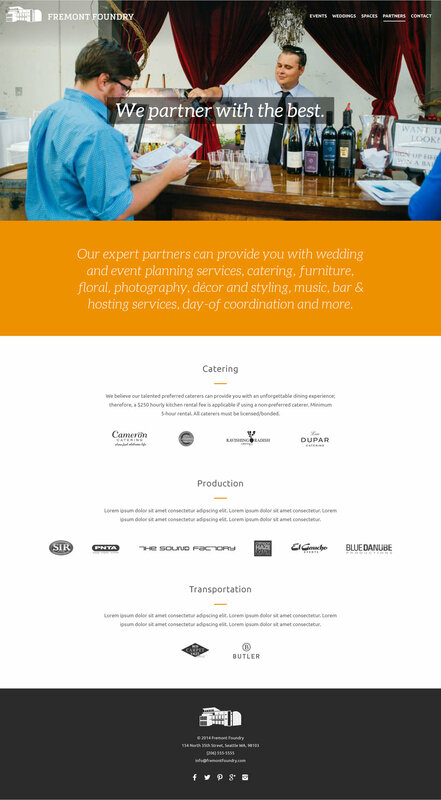 Because weddings are one of the more popular events at Fremont Foundry, we decided to highlight them on their own page, and feature it in the main navigation. Furthermore, we hoped to improve SEO by featuring Weddings in the main navigation, which would help clients searching searching for wedding venues in Seattle find Fremont Foundry. We downplayed the prominence of the floor plans that were heavily featured in the old site by placing them at the end of a slideshow on the new Spaces page. Each space has a description and a set of images so that users can get a feel of which space might be best for their event. While it was still important to highlight Fremont Foundry's partners, we reduced the logo sizes to give them less prominence. We added descriptions of the partner services, which was lacking on the former site. I was working with little to no staff and a tiny budget, when Tara and her team had to basically, start from scratch to create a site that was informative and impressive. It was a long process as I was still gathering images and content, and had no time to dedicate to design reviews, but Tara hung in there with me, and worked hard to make the designing process easy. She understood the aesthetic concept I wanted right away, and helped direct the marketing content I provided to the level we needed. She created the style components, and showed consistency in her attention to detail. She was a great project manager overall, demonstrating great tracking and administration of the project. We loved the results! Functionality, aesthetic and theme, image use, and content make it a website we are very proud of. Business is booming and we often received compliments on the our site. I would recommend her for any design project needing a great creative director.